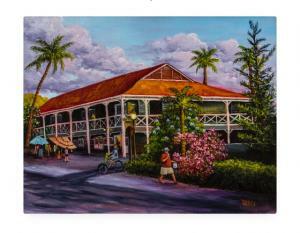 Lahaina Maui is full of old historic buildings. The Pioneer Inn was built in 1901by an Englishman named George Freeland. He came to Hawaii as a Royal Canadian Mountie with instructions to "get his man". The venture failed and in order to avoid embarrassment back home in Vancouver, he decided to make Hawaii his new home. The Inn is located right across the street from the Banyan Tree Part. Through the years the Plantation style building was expanded and it now has souvenir shops, both in doors and out. In the scene that I painted you see a man eating an ice cream cone, carrying a small shopping bag. A local man on his bike with his parrot sitting on the handles. A mother and child watching the colorful parrots under the umbrellas and a man watching the activity from the top floor of the Inn. The sun is setting giving the clouds a soft pink glow. It's also shining on the roof top and the top of the bushes. Life is busy on Front Street in Lahaina at all times of the day. This particular day I was sitting across the street from the Pioneer Inn listening to a Hawaiian concert at the Baldwin House Museum. I noticed the warm light from the sunset hitting the Inn. I took quite a few pictures capturing the moment, knowing I was going to paint that scene.